Led by junior Terrance West, who ran for 183 yards on 21 carries and scored two touchdowns, Towson football overcame four turnovers to defeat Albany, 44-17, Saturday afternoon. For the Tigers, now 7-1 overall and 3-1 in the Colonial Athletic Association (CAA), it marked their eighth consecutive win on the road. 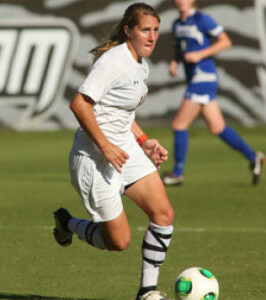 Emily Banes became Towson’s career leader in goals on Sunday, with 28. Senior Emily Banes added to her growing collection of record-setting performances Sunday against Hofstra. With her goal in the 52nd minute of a 2-1 loss at the Towson Soccer Facility, Banes became Towson’s career leader in goals with 28. The Tigers finish their three-game homestand this Saturday, Oct. 26, against Delaware State at 2 p.m. Towson will honor its 11 seniors in a ceremony immediately before the game. Volleyball dropped a pair of 3-0 matches last week, falling at Northeastern on Friday and Hofstra on Sunday. In Boston, freshman Lindsay Flaherty hit .818 for the match to lead the Tigers’ effort, and finished with nine kills and no errors in 11 attack attempts. She also added a match-high six blocks, two assists and two digs. In Hempstead, N.Y., sophomore Haley Pa’akaula hit .467 with nine kills to lead the Tigers against host Hofstra. Junior Saitaua Iosia finished with a team-high 10 kills while sophomore Kelsey Polak came off the bench to dish out nine assists and a team-high five digs. Volleyball heads to Annapolis to face Navy on Tuesday, Oct. 22, 7 p.m. Competing in its first road dual meets of the season, women’s swimming and diving defeated Georgetown, 247-53, and William & Mary, 221-73, on Saturday. The Tigers (4-0 overall, 1-0 CAA) received wins from senior Kaitlin Burke in the 200-yard freestyle, the 500-yard freestyle and the 1,000-yard freestyle to lead the way and impress head coach Pat Mead. The men’s team defeated host Georgetown, 205-79, but fell to William & Mary, 162-122. The Tigers (3-1, 0-1 CAA) got outstanding performances from a trio of freshmen—Nick Breschi, Brandon Ress and Jeremy Liu—to lead a strong overall performance. The women and men next face Old Dominion this Saturday at Burdick Pool beginning at 1 p.m.
Running in its final meet before the CAA Championship, women’s cross country placed sixth at the Penn State National Meet this past Friday. Towson scored 160 points, narrowly missing the top five teams. Juniors Elisabeth Tauber and Ashley Simmons, freshman Megan Knoblock, and junior Kara Bucaro were the Tigers’ top four finishers and all ran times under 23:30. The Tigers next host the CAA Championship at Oregon Ridge Park on Saturday, Nov. 2. Field hockey’s on-field struggles continued this past Friday as American University defeated the Tigers, 4-0 , in Washington, D.C. The game marked the final non-conference matchup of the regular season for Towson (1-13, 0-3 CAA), which now has games remaining against CAA opponents Northeastern, Hofstra and Drexel. The Tigers host Northeastern this Friday, Oct. 25, at 6 p.m. at Johnny Unitas Stadium in what will be their final home game this season. Prior to the game, the team will honor seniors Kathleen Morris and Kate Williams.